As responsible corporates, we are committed to deliver quality services that are reliable and effective. Our corporate ethos is embodied in our commitment towards nation., society, clients, and our channel partners . It is considered fundamental and a core belief, that a metric of our success is our consistently high level attitude of sincerity and professionalism regarding our client's fiscal well-being. The ethos behind our inspiration is the concept that our clients always come first, and by fully supporting and empowering our managers, we enable them to meet or exceed our client's financial goals. By providing the tools and methodologies our teams needs to remain cutting-edge, KMindz Advisory Services successfully out-performs its stated goals year after year. We believe in providing unparallel services, thereby allowing us to cultivate long-term and rewarding associations with our clients. Our organization insists to stand out with better client service and satisfied clients. We Aim higher. Strive for fabulous, standout, outrageously great service to set a startup business apart from the crowd. We hereby promise to deliver ethical, professional and transparent business practices. To ensure the highest quality and reliability in every service that we provide. To exercise the highest standards of quality control at every step. To strive to present the absolute truth about our services and their benefits to all our valued clients and partners. To aim to provide clients satisfaction at all times. To address every endeavor with total professionalism and integrity. We continually improve our performance and implement effective development programs to enhance our employees' competence and awareness. Bountiful databank of talent pool. Filtration of profiles as per clients' requirements. Reference checks to avoid half truths. Follow-up with clients and candidates at all levels. Psychometric tests conducted on clients' requests. 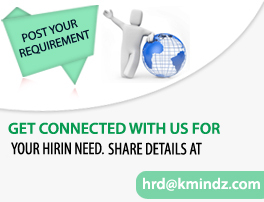 A right blend of professional and diligent in-house resources maximize the efficiency of KMINDZ. KMindz advisory services promise great speed, accuracy, information and follow-up to Provide "value" of the service. Says Gross, "Customers want Service that is well organized, attractively displayed and easy to find ". That's how today's customers define convenience, and that's what we provide. 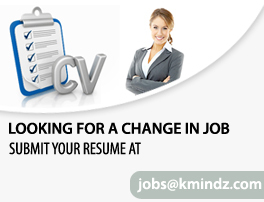 We filter the resumes in order to provide the right candidate for the right position. Confidentiality on client specific policies and procedures is always maintained. Our team sticks to a definite set of quality control measures and under no circumstances we would compromise in that quality. Each of our teams are led by Vertical Heads having extensive industry experience along with core team of consultants and the support team of research associates. Our team proactively tailoring innovative solutions to fully meet each of our client's individual needs. Our team mission statement is "Great Association with Quality Deal Flow".